Matt Adams - Superheroes, Sci-Fi, and a Touch of the Fantastic: "Do you have any books with a girl superhero?" "Do you have any books with a girl superhero?" 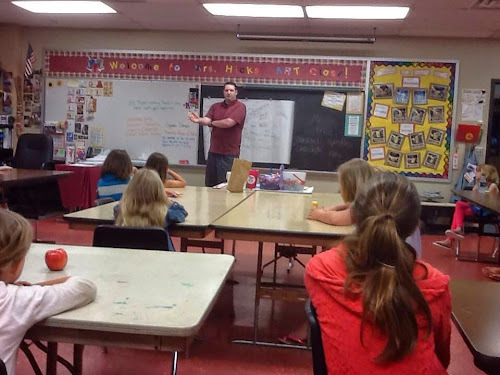 Not too long ago, I had the opportunity to speak to some students at my old elementary school. 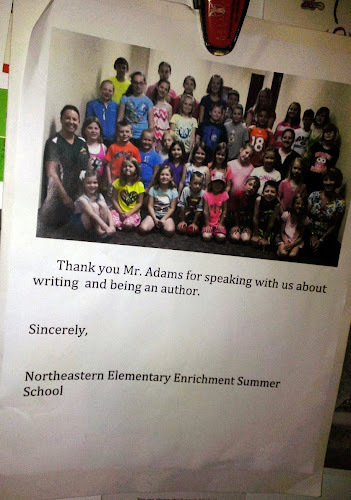 I talked to kids enrolled in Northeastern Elementary's (Fountain City, Indiana) summer enrichment program about writing and publishing. I found it challenging for a couple reasons. First, the students ranged in age from kindergarten to sixth grade. That's a pretty big age range. Second, I wasn't sure how much kids would care about the writing and publishing process. I had to fill an hour...and I wasn't sure I'd be able to do it. I put together a brief presentation and hoped we'd be able to fill the rest of the time with questions from the kids. They came through in a big way, thank goodness. I told the students I went to Northeastern and graduated from the high school in 1999. The room where I made the presentation was the art room--yes, the same art room where I attended art class in elementary school. I stressed to them the importance of reading. I didn't want them to see me as "big shot author" because that's a horrible way to talk to people and I don't even remotely qualify as a "big shot author." I simply like to write and I've devoted more and more time and energy to it over the years. I mentioned some of my favorite books as a kid: I am a Puppy; There's a Monster at the End of This Book; Alexander and the Terrible, Horrible, No Good, Very Bad Day; and My Teacher is an Alien. When I'm actively working on something, I try to write about 10 pages a day. I brought a typed manuscript that was 2,000 words as a visual aid. Then I showed them a 50,000 word manuscript--one of the early (and frankly awful) versions of I, Crimsonstreak. Next, I held up a 95,000 word manuscript of I, Crimsonstreak that's very close to the finished version. And, of course, I had a paperback copy of the book to show them the final product. They were inquisitive. They wanted to know about my writing routine, how I came up with my ideas, and how long it took to write a book. The answers vary from writer to writer, but I shared my experience with them. They had more questions. One really stuck with me. To tell you the truth, I didn't expect to get that question from the class. I managed not to hesitate too much. I explained to her that the main character in my book is a guy and that his mother and girlfriend play major roles. One of the things my publisher liked about the book is that my female characters weren't props or damsels in distress, even if they weren't the main protagonist. How do you explain that to a little girl in an elementary school? Does she care that the publisher thought the females in my book are good "side" characters? Of course she doesn't. She wants a superhero book with a protagonist that she can relate to, and that book isn't I, Crimsonstreak. I've heard the comments about DC's failed attempts to get Wonder Woman on the big screen and grumbling about the lack of a Captain Marvel movie, but I haven't given these things enough thought. Let's face it, The Avengers is primarily a boys' club (and I love the movie and what Marvel has done with its cinematic universe). You've got Black Widow and Maria Hill, but that's about it. Shouldn't there be a movie girls can look up to and say, "I wanna be Captain Marvel," just like boys can see Captain America and say, "I wanna be Cap"? I'm a guy, okay? I like explosions and sports and I love seeing the Hulk throw Loki around like a ragdoll. My sense of humor borders on the psychotic at times, and I joke about a wide range of topics. But the more I think about, the more I realize there has to be something out there other than dollhouses or Barbie's pink car. This stuff is important, even though I lack the eloquence to say exactly why. Then again, I don't really need eloquence in this case. I see that little girl, raising her hand and politely asking, "Do you have any books with a girl superhero?" After talking briefly about Crimsonstreak,, I remembered to tell her that one of my unpublished novels features a female superhero who controls fire. Her response? "When you get that one published, I want to read it."